Ready for a trip of a lifetime to one of the most magical, peaceful places on Earth? A mysterious Himalayan kingdom, Bhutan is a serene place where Buddhism is the essential foundation interwoven throughout daily life. Intense storms in these dramatic mountains gave Bhutan its name which means “Land of the Thunder Dragon.” The landscape of deep valleys, lush forests and striking mountains is treasured by the Bhutanese people. This journey will immerse you in the rich culture, nature and people of Bhutan in a concise seven day itinerary. From the bustling markets of the capital city of Thimphu, into a traditional Bhutanese home, visiting the famous temples and dzongs in Punakha, and crowned with a hike to the Tigers Nest Monastery. The tranquil kingdom of Bhutan is often called the “last Shangri-La.” The combination of Buddhist cultural traditions and stunning landscape make Bhutan a cherished destination. Be one of the few travelers to experience Bhutan’s rural Himalayan life and unique, millennia-long artistic traditions. Bhutan has a magical quality that leaves travelers transformed. 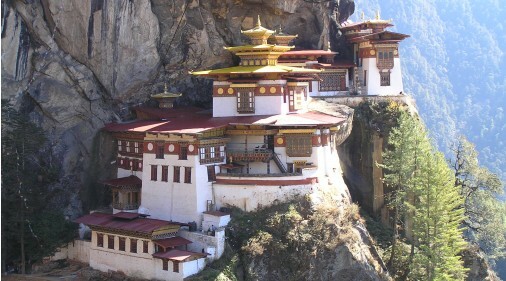 If you haven’t been to Bhutan the time to go is now! It’s amazing and the people will warm your heart.